The newest knit off my needles is Silver Birch from Sarah Cooke knit in Rowan's superb Softyak DK. I love this pattern! It makes the cutest baby hoodie and is so much fun to make. This is my second Silver Birch as my grandson outgrew his first one, and I know I'll make another one next year when he outgrows this one. 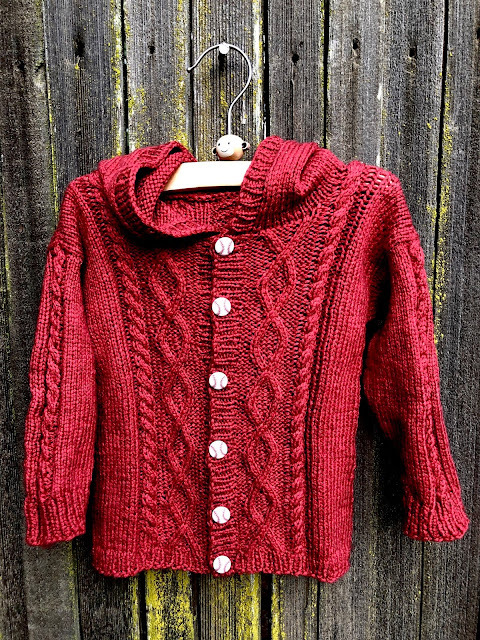 If you are new to cables or sweater construction in general, this would be a great first project. It looks complicated but it's not! I recommend this pattern to seasoned knitters and confident beginners. 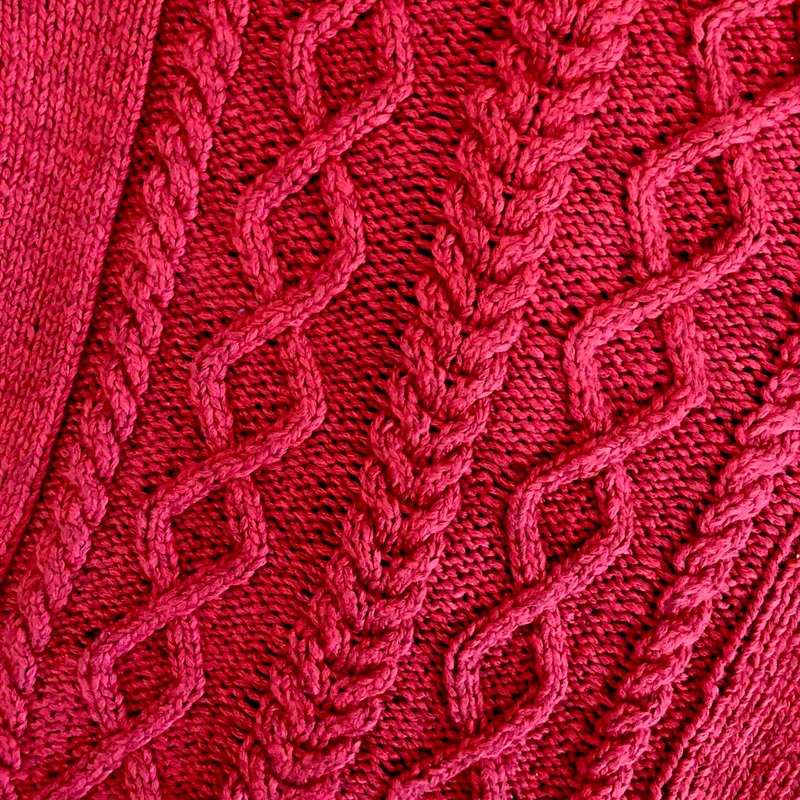 If you are ready to venture into the world of sweater construction and cables, this fantastic pattern will help you learn some very important basics, all on a tiny, beautiful sweater. You can do it! The designer has kindly offered my readers a 25% discount on Silver Birch from now until Saturday, July 21. Upon check out, use the code, knitionary, click apply now, and the discounted price will appear. The price will be only $3 for this darling pattern! Thank you Sarah! Here's a little bit about the construction and why I love this pattern so much: Silver Birch is knit from the bottom up in one piece; this means NO seaming. The pattern begins with the ribbing at the bottom, knitting both fronts and back at the same time. You will follow the cable pattern and knit the body up to the sleeve separation. Here you will divide it into three parts, right side, left side, and back, now working one piece at a time. When those three pieces are finished you will use a three-needle bind off to make the shoulder seams to attach fronts to back. Next you'll pick up stitches around the armhole and knit in the round down to the cuff. The hood is worked next, picking up stitches around the neck and working stockinette until it's time to do a three-needle bind off for hood top. 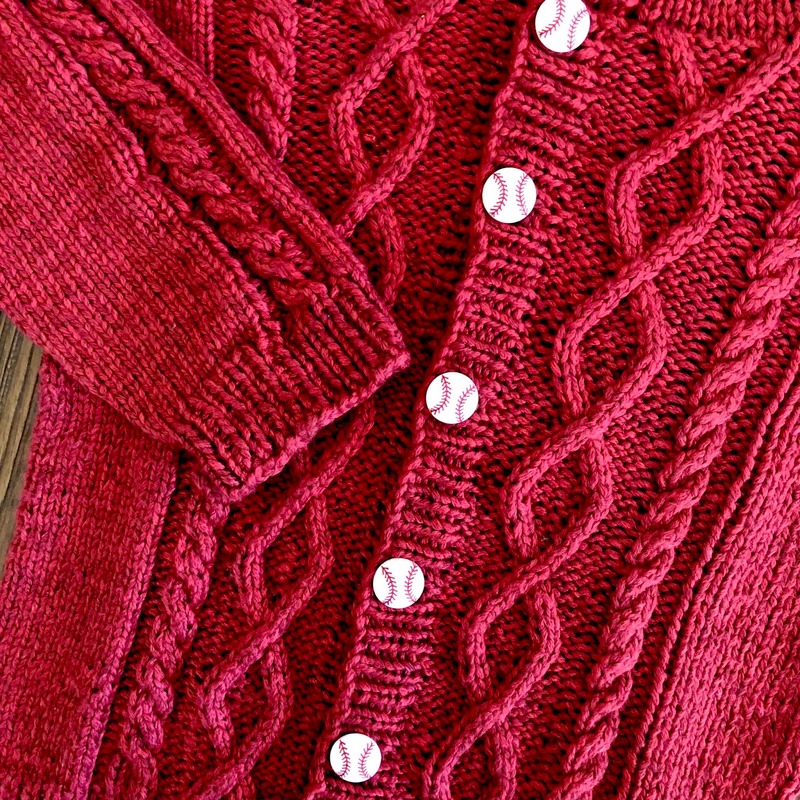 Lastly, for the ribbed button band, you'll pick up stitches around the right sweater front, up and around the hood, then down the left sweater front. 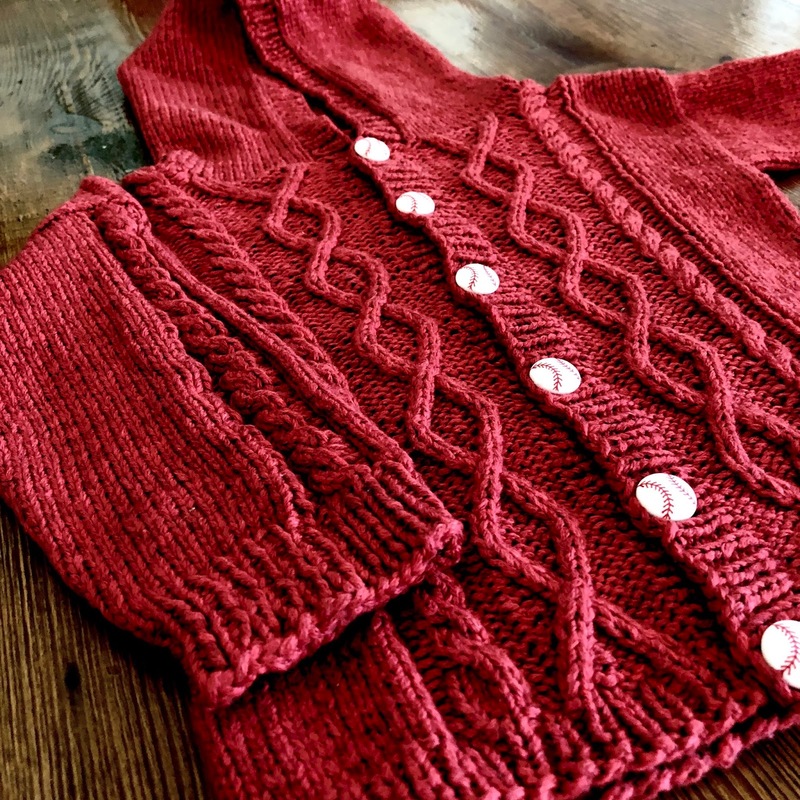 If any of these techniques are new to you, head over to YouTube; there are dozens of helpful tutorials on each technique--techniques that are really quite easy and techniques you'll need to know to make a garment, so why not try them out on a tiny sweater? The cable pattern is an easy 16 row repeat and a seasoned knitter will have it memorized after the first repeat. If this is your first cable project, you'll be amazed at how easy cables are as this is a very intuitive cable pattern. I positively love this yarn. 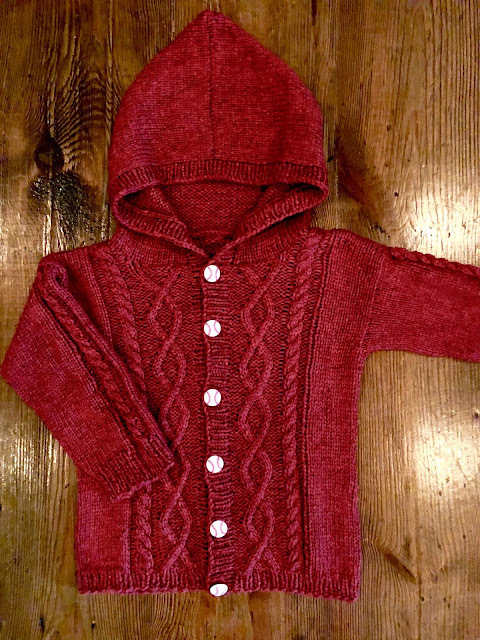 It's baby soft, easy to knit, and machine washable. Everyone gives it rave reviews. It is available at your local Rowan stockist or online. so I have invested in 12" circulars. I love the ChiaoGoos so much! I love the baseball buttons! We are a baseball loving family (Go Giants!) and I know my son will love this for his baby. It is a great little pattern. I really like Sarah Cooke's designs and pattern writing style. Beautiful sweater.! I really like the color you've chosen too. Rowan, brand is one of my favorite yarns to use. I'm with you, I don't like double pointed needles either, they are awkward and uncomfortable. Thank you! Rowan is close to my heart. I fell in love with them when I first started to get back into knitting in the 80s. As for DPNs, I am enthralled when I see knitters handle 4 and 5 needles with ease. I just stare in awe!